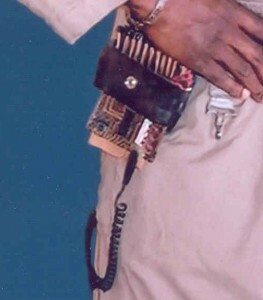 The "Belt Gizmo" is a device worn on the pistol belt. 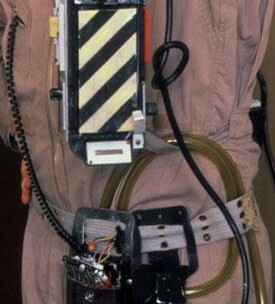 While its purpose is unclear, it is commonly thought to be a type of read-out or warning system for the Proton Pack. Featured in both films as well as the 2009 video game, it is nonetheless an integral part of the Ghostbusters' equipment. The main circuit board sits in a modified tape measure holder and connects to a smaller "daughterboard" via a black coil cord. The display is normally comprised of eight nixie tubes and an error box (although stunt versions had anywhere from 9-11 tubes). 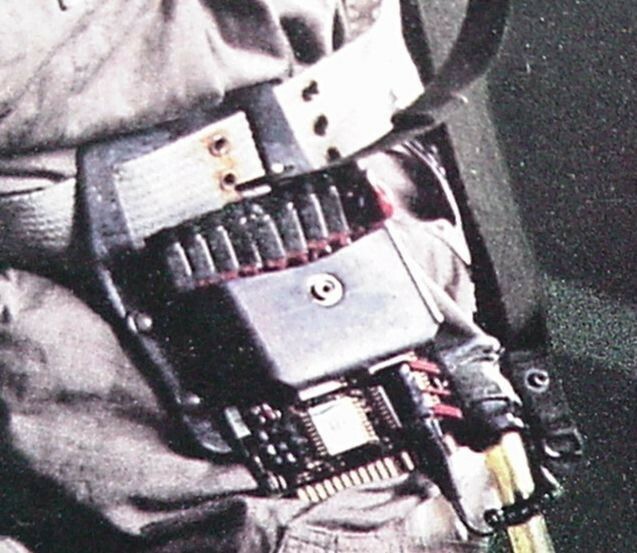 For the early NYC shooting of Ghostbusters, the Belt Gizmos were made from Sanyo ICC-808D calculator circuit boards; these were badly damaged during production and were replaced with rubber stunt versions used for the rest of the LA shooting. 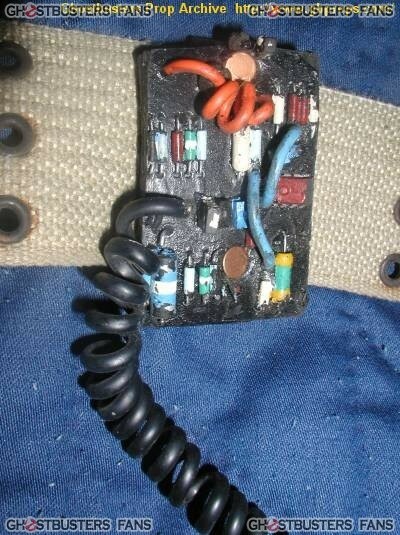 The daughterboards simply appear to be cobbled together pieces of circuitry, wires, and wire caps. As evident in the few screen shots and stills available, no two daughterboards are the same. 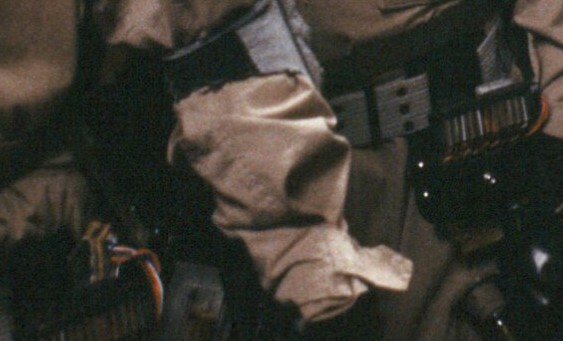 In some of the early promotional photos Ray's coil cord connects to his chest pocket. The main circuit board also appears to be badly damaged. GB1 Belt Gizmo (LA shooting - replica board) - Note the eleven tubes + error box. 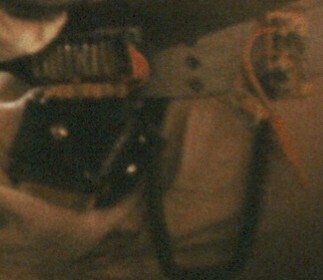 Note the twisted wires and belt clip on Ray's daughterboard (left) and the white box behind Egon's Belt Gizmo (right). 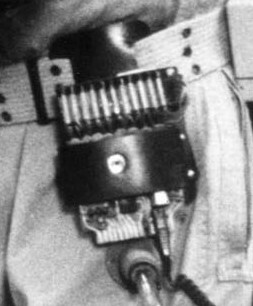 GB1 Belt Gizmo (NYC shooting - stunt board) - Note the broken coil cord. 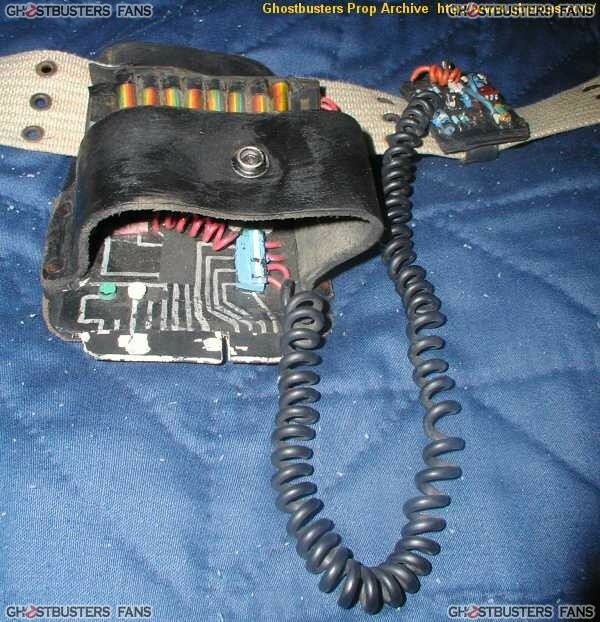 This Belt Gizmo (possibly a GB1 stunt board) was worn by Ernie Hudson when attending conventions several years ago. 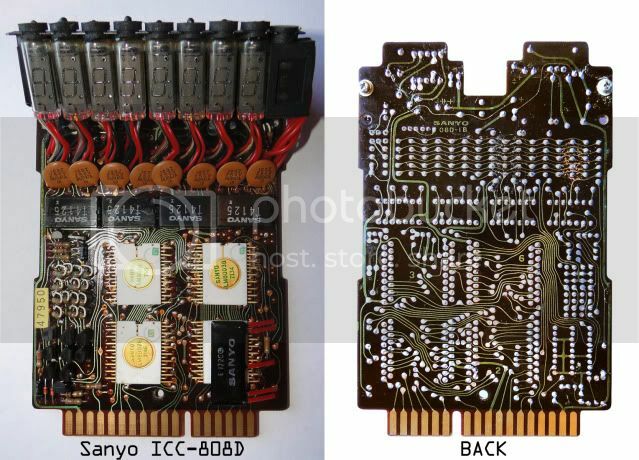 The Belt Gizmos used in Ghostbusters II are rubber replicas loosely based on the original Sanyo boards. Instead of nixie tubes, these props feature rainbow ribbon cable inserted into clear plastic tubing. Although these were the only Belt Gizmos built for GB2, fans frequently refer to them as "stunt boards" due to their shoddy design. Another difference is the varying length of coil cord used on these gizmos; some had very short cords, whereas others had the standard length (as seen below). The daughterboards appear to be made of leather. Note the shorter coil cord. 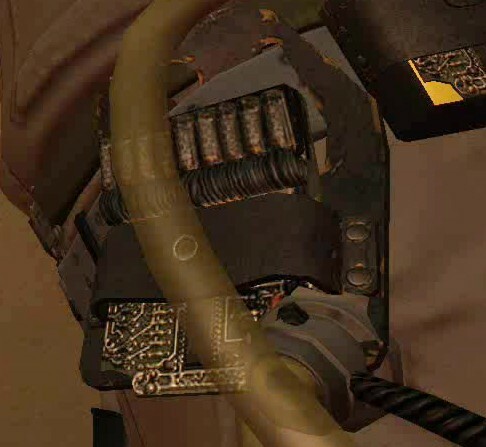 The Belt Gizmos seen in Ghostbusters: The Video Game appear to be styled after the GB1 replica boards used during the LA shooting. 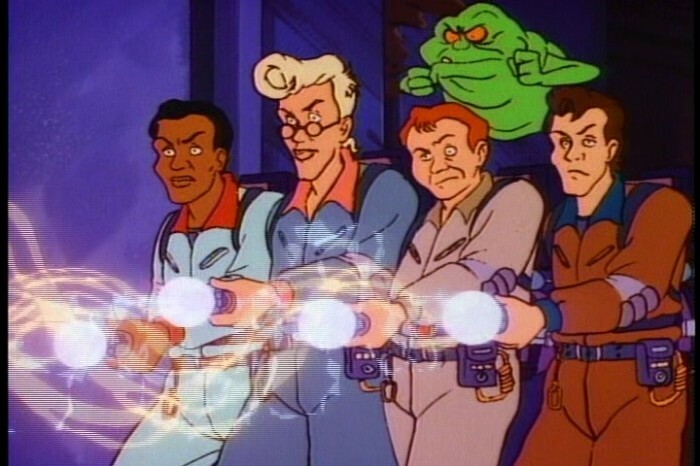 The Belt Gizmos were given a new design in the animated series The Real Ghostbusters. 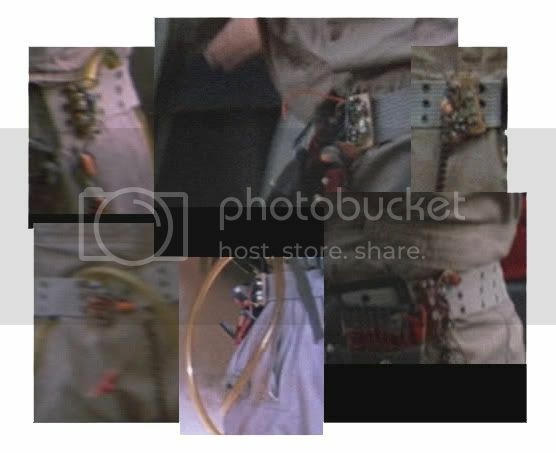 In the Season 3 episode entitled, "Once Upon a Slime," Egon's belt gizmo gives off an audible alert and the readout flashes, "ECTO," indicating that the Ecto-2's Emergency Beacon had activated. It is not explained if this is its primary or only function, or if it can broadcast as well as receive.